Draft: 2014, Texas Rangers, 8th rd. Erik Swanson…resides in Terrace Park, OH…attended Mariemont (OH) High School…earned Outstanding Pitcher honors while leading Iowa Western CC to the NJCAA Division I title in 2014…signed with the University of Pittsburgh before being drafted. April 14, 2019 Seattle Mariners recalled RHP Erik Swanson from Tacoma Rainiers. April 12, 2019 Seattle Mariners optioned RHP Erik Swanson to Tacoma Rainiers. April 9, 2019 Seattle Mariners recalled Erik Swanson from Tacoma Rainiers. 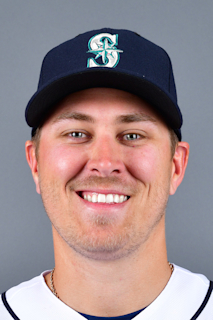 March 11, 2019 Seattle Mariners optioned RHP Erik Swanson to Tacoma Rainiers. November 20, 2018 Seattle Mariners selected the contract of Erik Swanson from Tacoma Rainiers. November 19, 2018 Seattle Mariners traded LHP James Paxton to New York Yankees for LHP Justus Sheffield, RHP Erik Swanson and Dom Thompson-Williams. November 19, 2018 RHP Erik Swanson assigned to Tacoma Rainiers. September 24, 2018 Scranton/Wilkes-Barre RailRiders activated RHP Erik Swanson from the 7-day disabled list. September 8, 2018 Scranton/Wilkes-Barre RailRiders placed RHP Erik Swanson on the 7-day disabled list. July 14, 2018 Scranton/Wilkes-Barre RailRiders activated RHP Erik Swanson from the 7-day disabled list. July 5, 2018 Scranton/Wilkes-Barre RailRiders sent RHP Erik Swanson on a rehab assignment to Staten Island Yankees. June 14, 2018 Scranton/Wilkes-Barre RailRiders placed RHP Erik Swanson on the 7-day disabled list retroactive to June 13, 2018. May 21, 2018 RHP Erik Swanson assigned to Scranton/Wilkes-Barre RailRiders from Trenton Thunder. April 3, 2018 RHP Erik Swanson assigned to Trenton Thunder from Tampa Tarpons. June 24, 2017 Tampa Yankees activated RHP Erik Swanson from the 7-day disabled list. June 3, 2017 Tampa Yankees placed RHP Erik Swanson on the 7-day disabled list. April 28, 2017 RHP Erik Swanson assigned to Tampa Yankees from Charleston RiverDogs. April 28, 2017 RHP Erik Swanson roster status changed by Charleston RiverDogs. April 6, 2017 RHP Erik Swanson assigned to Charleston RiverDogs from GCL Yankees East. August 27, 2016 RHP Erik Swanson assigned to GCL Yankees East from Charleston RiverDogs. August 3, 2016 RHP Erik Swanson assigned to Charleston RiverDogs. September 28, 2015 Hickory Crawdads activated RHP Erik Swanson from the 7-day disabled list. August 21, 2015 Hickory Crawdads sent RHP Erik Swanson on a rehab assignment to AZL Rangers. July 23, 2015 Hickory Crawdads placed RHP Erik Swanson on the 7-day disabled list. June 20, 2015 RHP Erik Swanson assigned to Hickory Crawdads from AZL Rangers. June 19, 2015 RHP Erik Swanson assigned to AZL Rangers from Frisco RoughRiders. June 13, 2015 RHP Erik Swanson assigned to Frisco RoughRiders from Round Rock Express. June 5, 2015 RHP Erik Swanson assigned to Round Rock Express from Spokane Indians. June 12, 2014 RHP Erik Swanson assigned to Spokane Indians. June 11, 2014 Texas Rangers signed RHP Erik Swanson.